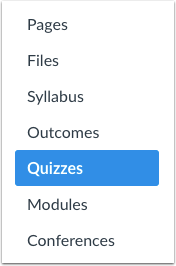 When creating or editing a quiz, you can assign a quiz to a specific course section. Availability date functionality is still available for each quiz. 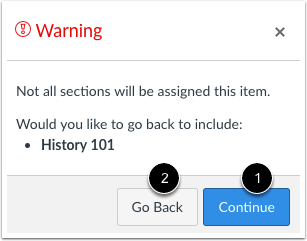 Only the section(s) specified in the discussion details can view the quiz. 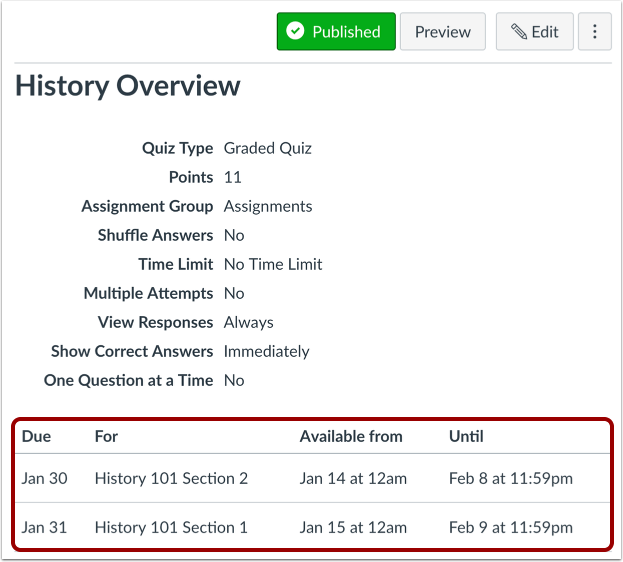 When using differentiated assignments with the Gradebook, the quiz appears as a column for all students, but grade cells are grayed out for students who have not been included in the quiz. Grades cannot be assigned for students who have not been included in the quiz, and quizzes that are not assigned to a student are not factored into overall grades. When Multiple Grading Periods are enabled in a course, quizzes are also respected against closed grading periods. Enter a name  and description  for your quiz, as well as any other quiz options . Due : Set the date and time that the Quiz is due. 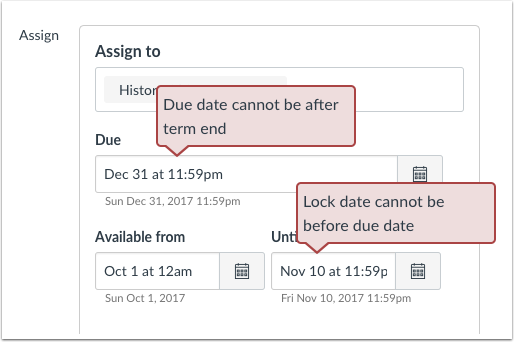 The due date will already be populated for you if you created an assignment shell, but you can change it if necessary. Available From : Set the date and time when the Quiz will become available. Until : Set the date and time when the Quiz will no longer be available. 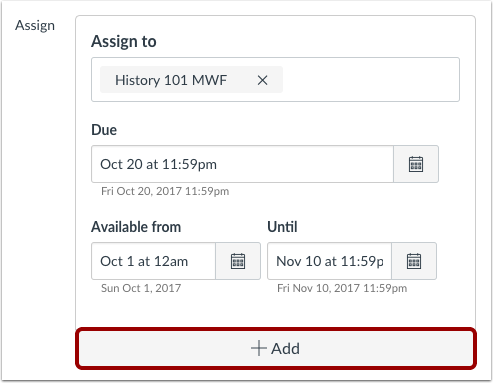 If the course does not include specified course start and end dates, Canvas validates the quiz against the term date set for the course. 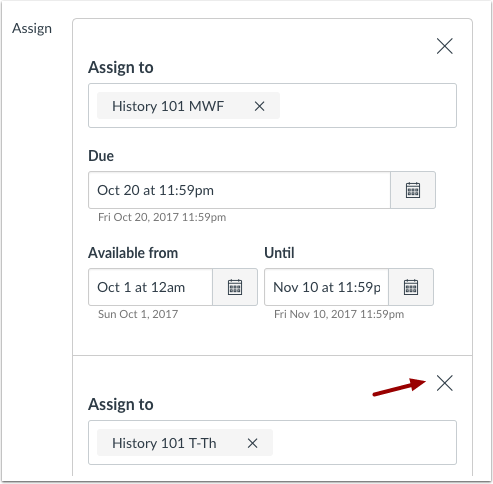 If your course is using Multiple Grading Periods, the Assign field validates the due date against the closed grading period and requires the quiz date to be past the date of the closed grading period. View the dates and users assigned to the quiz. On the Quizzes Index Page, the quiz shows there are multiple users and dates assigned to the quiz. 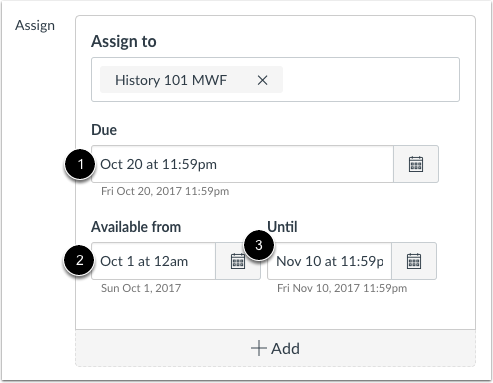 Hover over the text to view date availability. Previous Topic:How do I assign a quiz to an individual student? Next Topic:How do I delete a quiz? Table of Contents > Quizzes > How do I assign a quiz to a course section? Could you post a screenshot of the "Assign to" settings? Something else to consider is escalating this to Canvas Support. Thanks for posting this screen shot! Because everything here looks correct, I think your best route is to reach out to our Canvas Support team. If they can't figure out and fix the problem, they have the resources to escalate this issue so that it gets addressed by those who can. 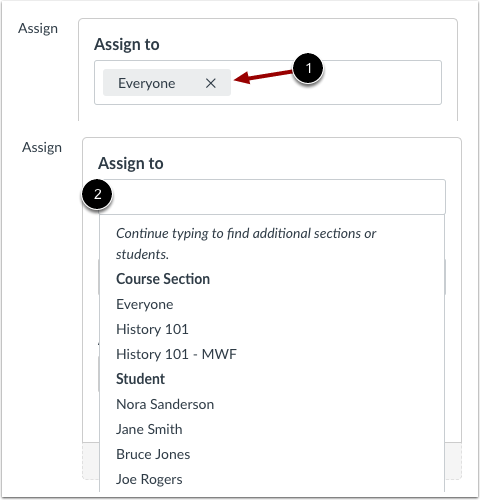 Check out How do I get help with Canvas as an instructor? for more information about contacting support. Please keep in touch and let us know how this resolution process goes. Re: Can I set up groups for individual quizzes? 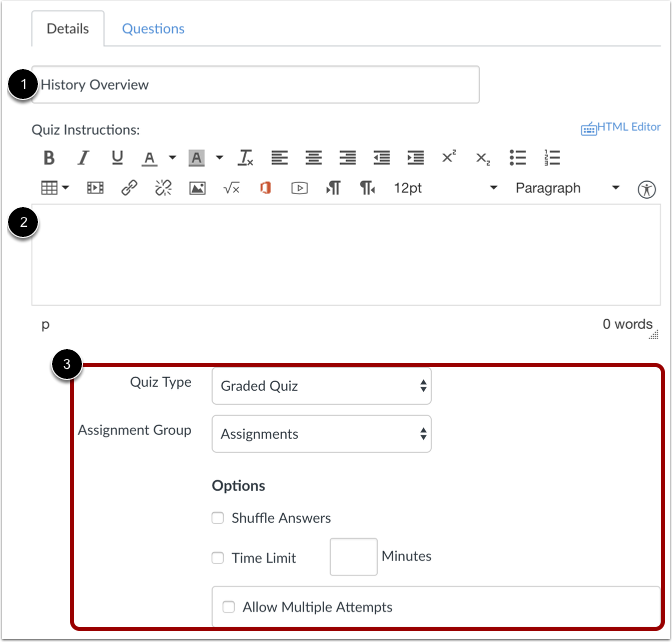 Re: How do I add students to differentiated assessments (quizzes) in Canvas without having to add them manually one at a time.